Can Autoplaying Videos Hurt Your Search Engine Rankings? I’m going to do something a little unusual here; rather than spend a couple thousand words talking circles around a topic before I answer it, I’ll give you an answer straight-up. Does Google penalize a website when that website has an autoplaying video embedded on the page? What this means is that, as of one year ago, Google does not penalize autoplaying video, no matter how much individual users don’t like it, and even when those users work for Google. Now, you and I both know that a lot can change in a year, but I can’t find any indication or official word from Google that autoplaying videos earn a penalty now. Incidentally, if you know of any new word about the subject, please leave a link in the comments. All of that said, I still think autoplaying videos is one of the worst things you can do to a site. It might not hurt you directly with a penalty from Google, but it CAN hurt you in indirect ways. There are a solid handful of different ways an autoplay video can hurt your site, so let’s go over them. We take it for granted these days with broadband readily available and 4G or better cell service all over the country, but video content is still large and intensive on the connection. As technology has improved, so too have the “minimum standards” for a good video. YouTube at least is smart enough to dynamically adjust quality levels for slower connections, but not all video players do so, and it’s not always an option. 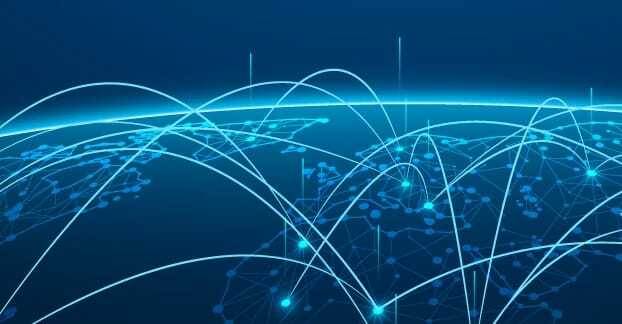 If you’ve ever tried to use a rural DSL or satellite connection, or you’ve tried to browse the internet via an older cell connection, you know how frustrating it can be to load a website. Even a simple page with a couple of scripts and some images can take up to a minute to load on a slower connection. As we all know, page load times are a search ranking factor. Every element on a page makes that page load slower. 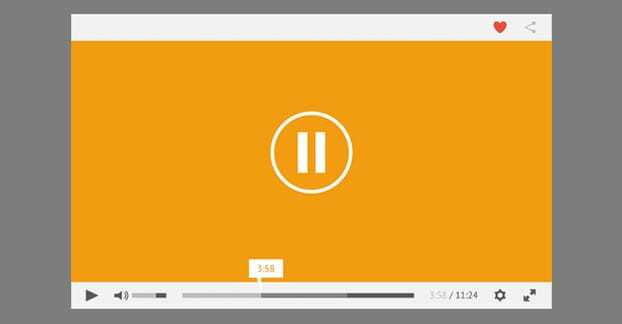 An autoplay video, meanwhile, is a large piece of multimedia that you want loaded to play when a user is loading the page. After all, if it doesn’t load until after the page is loaded, the user may have scrolled past it already, and then it’ll just be a distraction. Video, by necessity, is going to slow down your page. Now, Google isn’t going to be testing how your page loads on a slow DSL connection, but they CAN benchmark your page load times against equivalent pages. When they find that your page is loading a video and thus loading slower, even if that video is embedded from YouTube or whatever fast CDN you choose to use, it’s still going to hold you back. No matter how quickly your video loads, unless you’re intentionally forcing it to load before your content – which no one has ever done and no one will ever do – it won’t be able to start playing before the user has started to browse your page. It doesn’t really matter what the content of your video is; if a user is reading your text content and a video starts playing, they’re going to be distracted. That kind of interruption is very much not good for your followers. This is also the same reason exit intent pop-overs are so much better than timed pop-overs. A timer means at some point the user will be interrupted. An exit-intent pop means that it only triggers when the user is ready to leave anyway. The only users who aren’t affected by this sudden burst of video are users who don’t have sound. Users who don’t have sound aren’t your target audience for video marketing anyway, right? If they are, you might as well just be embedded animated gifs instead. Now take a moment to think about the worse cases that could crop up. A user is actually interested and reading your content. Your video blasts noise over their speakers or headphones, possibly too loud. They have to scramble to find and stop it, and have lost their place – and their interest – in your content. A user is browsing your page in a public space, like a coffee shop or in a class. They didn’t realize their speakers weren’t muted, and suddenly your video starts playing. At best they’re embarrassed; at worst it can damage them in their personal life. A user is browsing while listening to their own content; music, a podcast, another video. Some people are able to multi-task like that, you know. Your video starts to play, and not only do they have to stop what they’re doing to mute it, they have to leave your content so they can go back and replay the last minute of what they were listening to, in the case of podcasts and the like. All of these cases are instances where an autoplay video is actively detrimental to your audience. In no case is the user likely to go back and want to watch that rude interruption. You can think about it another way. Imagine if you were reading a book, and then halfway through the first page of a new chapter, someone started screaming a commercial in your ear. Maybe the commercial was for the book, or maybe it was for something unrelated; you don’t know, because you slammed the book closed to punch them for screaming at you. Believe it or not, there are people with visual impairments who browse the internet. People without handicaps don’t tend to think about the people who do, and it can cause a significant loss of reputation, traffic, or just accessibility. There are standards for building construction that specify things like handicap access, right? If you have a retail storefront, you need things like handicap parking and wheelchair access. The same goes for the web, but in this case, the governing body is just the W3C. The W3C does, in fact, have accessibility guidelines. They can’t reach out and punish you for not abiding by them, but they can refuse to issue compliance certifications if you’re aiming to get one. 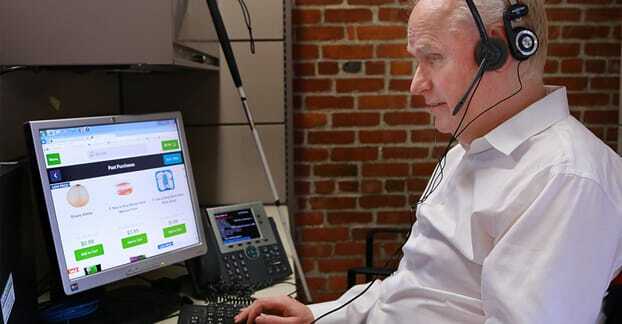 Back to the impaired; people with little or no vision are able to browse the web with the assistance of various text-to-speech accessibility options. There are tools built into operating systems and browsers to help such people navigate the web, not to mention third party tools. Now imagine those scenarios above, where a user is reading your page, intent in their focus, and a video starts screaming at them. There’s a lot of surprise, confusion, and anger there, but the user is at least able to rapidly scroll up, find the video, and stop it. Now imagine that same person is forced to browse the web by listening to it. When your video starts to play, not only is the user unable to keep browsing, they are unable to locate a way to turn the video off. They essentially have two options; wait for the video to end, or close the website entirely. I know which one I would choose! The W3C covers accessibility criteria in a few places. You can read more in this page about accessibility and this page about video specifically. 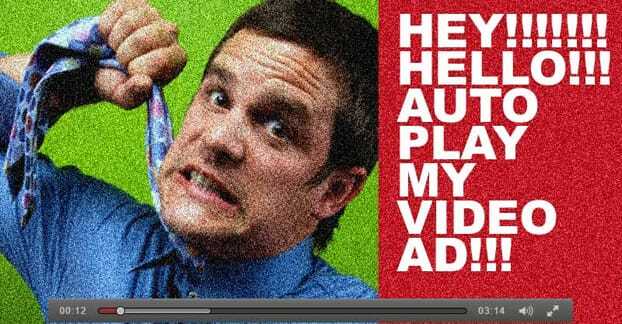 If you’re using autoplay video, you’re probably doing it intentionally. If you’re doing it intentionally, that means you’re making it part of your marketing plan. What do you do then, if it doesn’t work? How heavily is your landing page or whatever reliant upon it? There are a lot of ways it might not work. Remember back when most video players ran in Flash, and the iPhone didn’t render Flash at all? That was one of the primary incentives to replace Flash with HTML5, among other things. There are similar issues. For one thing, some mobile devices still won’t render an autoplay video, or even load a video fast enough to play before a user is done browsing anyway. 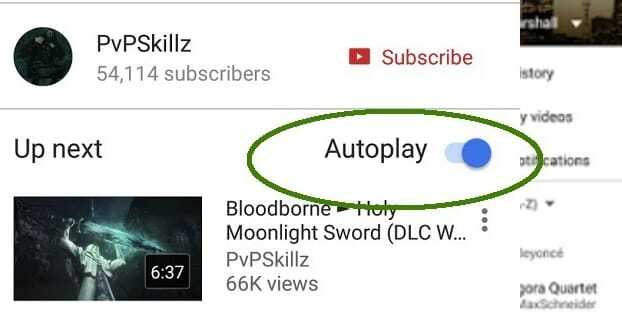 Additionally, a lot of users are starting to install “disable autoplay” plugins, the same way they use ad-blocking software. 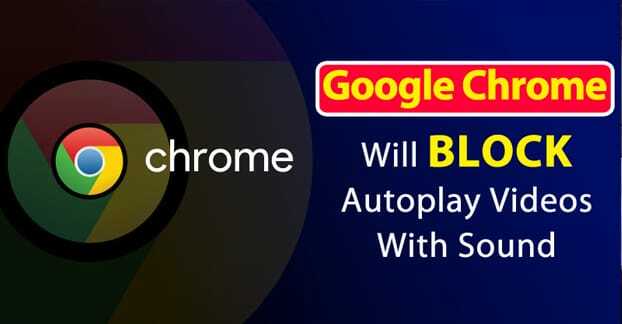 More importantly, though, both Chrome and Firefox – and other browsers will follow suit eventually – are starting to allow blocking of autoplay entirely. The option might not be front and center, but it exists on both browsers now, if you know where to look. Much like the click-to-enable setting for Flash has become default, I would not be at all surprised if in another year, autoplay is disabled by default at the web browser level. Where does that leave you? If your marketing relies on the video playing, you will need to shuffle around that marketing to encourage the video to play. That takes away from your core call to action, by requiring a sub-call to action just to get the video to play. Autoplay can work in some specific instances. I don’t like it on blog posts, homepages, or landing pages. Any case where the user is not expecting video content is a case where you should never have an autoplay video. On the other hand, can you imagine if YouTube made everyone manually click play on every video every time they landed on a video page? It would make the experience a lot less smooth. The difference here is that when a user lands on a YouTube video page, they’re going into it knowing there will be a video there. They will be prepared to view that video, with their attention focused on the video content and their volume tuned appropriately. I will also say that an autoplay video can work if you don’t rely on audio. An explainer video that operates via subtitles rather than voice-over can work well on a landing page. The motion attracts the eye, but the audio doesn’t distract the mind. Of course, if you’re going to go that option, you don’t need to make it a video at all. Animated gifs can work, though those are often a lot larger than an equivalent video and a lot slower to load. Instead, you can experiment with Gifv or Webm formatting; both of which are wrappers for mp4 video encodes. They essentially allow you to play a video without using a standard video player, operating more like an image that happens to have motion. Sound really is the crux of the issue. No one really cares if a video plays if it’s not disruptive with audio. That’s why autoplay videos on Facebook are so successful; they play automatically but they require an interaction to get the sound to play. The same goes for video on Twitter. Of course, you don’t have to take my word for it. This case study from Atomic DC indicates that using Facebook’s autoplay with no audio increased video shares by nearly 600%. 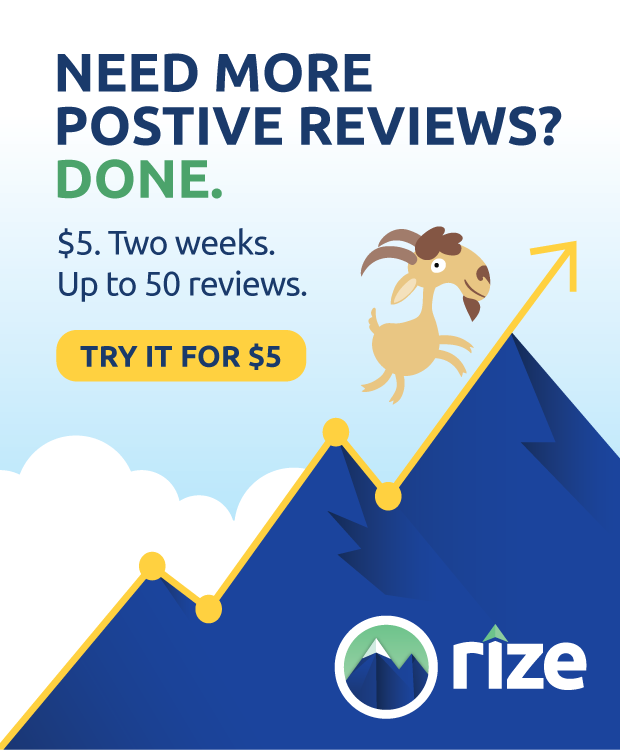 Meanwhile, Wistia mentions that removing an autoplay video from a landing page – where it had audio – caused an increase in organic traffic, an increase in sign-ups, and an improved bounce rate. The moral of the story is pretty simple, all things considered. Don’t yell at people, whether it’s from a car window, from a soapbox on the corner, or on your website. Disruptive audio destroys focus and leaves a bad taste in the mouth; just don’t do it.